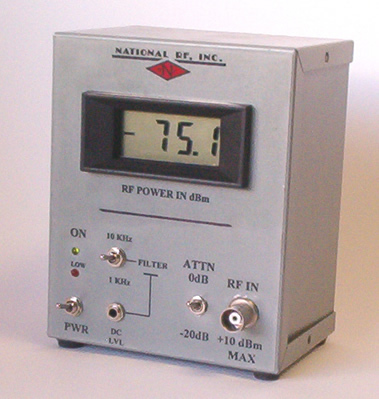 National RF’s Type NDB-2 and NDB-3 RF Milliwatt Meters are affordable pieces of test equipment for both the RF laboratory and the home experimenter. 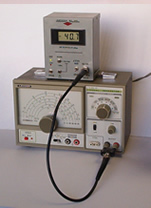 Both provide a digital reading of RF power in dB reference 1 milliwatt of power into a 50 ohm load (i.e. 0 dBm). The circuitry consists of a low noise logarithmic amplifier that drives a digital A/D converting meter circuit. The lowest power levels that can be read are about –73 dBm (approximately 40 microvolts or .00000003 milliwatts). The maximum power input should not exceed 10 milliwatts (+10 dBm or .010 watts) when inputed without attenuation. An internal attenuator is provided and described in the next section. All controls are located on the front panel. Power is provided by six AA size batteries, which are housed inside the unit. In addition to measuring RF, the Type NDB-3 provides a separate DC output signal, which is scaled to 10 millivolts per dB. 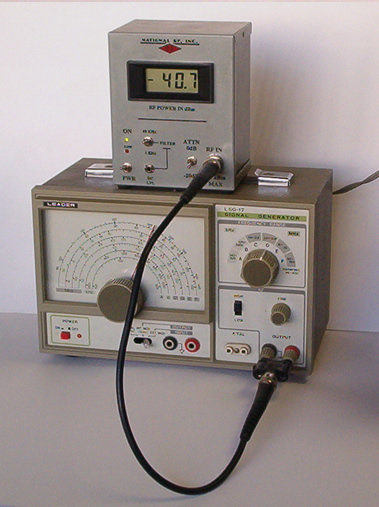 Thus, when the meter is used with a swept signal source, such as would be used when sweeping a filter, a useable scope display with a known, convenient logarithmic scale response is provided. Related to this output is selectable filtering, which is used in conjunction with the sweep speed of the swept generator. Both types have a “Low Battery” level display, alerting you to when battery replacement is necessary for proper calibrated readings. A 20 dB front panel selectable Pi-pad attenuator is provided as well on the input circuitry. When this function is selected, a maximum of 250 milliwatts (1/4 Watt) can be inputed continuously, and ½ Watt for short periods of time. 7 ¾ % applies to the base price of the hardware.